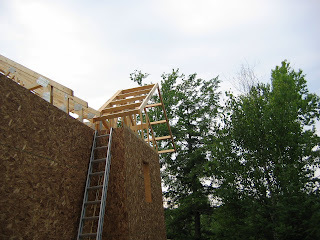 Cottage on the Edge - the DIY Cottage Blog: Ladders in the Roof! Ever wonder how they build those overhanging parts of roofs. Well they do it with something called a roof 'ladder'. The ladder for the front gable is illustrated in the picture. How this works is that the gable truss - that is the one at the very end - is actually shorter than its sister trusses. 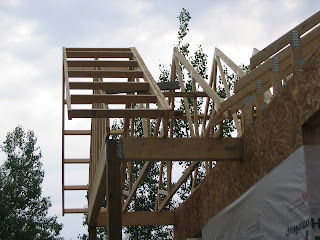 The ladder sits on top of this gable truss and hangs over - or cantilevered in building lingo. The opposite side of the ladder is nailed to the second truss, and voila! you have the roof overhang. There are two gabled ends on the cottage. The second one is around the side. BTW - My trusses were manufactured by Kent Trusses based out of Sundridge Ontario.